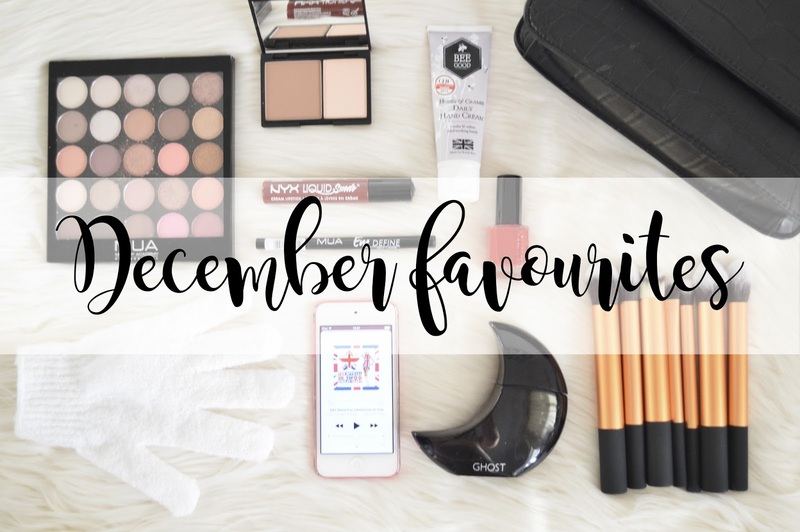 It's that time of the month again where I'm going to be sharing with you what my favourites have been during this month. As always I have been trying out new products which I have been purchasing throughout December or at the end of November and I cannot wait to share some of these with you! I have also featured a gorgeous contour palette which I won in a giveaway and I have completely and utterly fallen in love with it. I'd just like to wish everyone a Happy New Year too, and I hope you're not all getting too drunk! First things first is the Sleek Face Contour Kit in light which I won in a giveaway. I absolutely love my Sleek blushers so I was so freaking excited to try this out too and of course, I'm obsessed! I really love this contour kit because the contour is more of an ashy brown than the orange tone browns which you usually find. It really compliments my pale skin! The perfume of choice which I have been reaching for the most is Ghost Deep Night and it's 100% one of my favourites! I first found out about this as it's also one of my Mum's favourites too and she's gone through so many bottles of it! "GHOST Deep Night is the fragrance of love. It evokes hidden desire and reflects the moments where our minds and reflective of another time and day, another place, another feeling". Although it's a very mysterious scent, I do think you can wear it both during the day and at night which I love! I have been absolutely loving red nails throughout December and Makeup Revolution is definitely one of my favourite brands when it comes to Nail Varnish however they discontinued them which makes me so sad because I never had the chance to buy all of them! They're perfect for if you're lazy when applying nail varnish as they only need one coat and it takes atleast one minute to dry too! My favourite song throughout December of course has been a Christmas one and my ultimate favourite of all time is "All I Want For Christmas Is You"; I love everyone's version of this song, especially Michael Buble's; it's absolutely stunning when it's made so much slower! I'd listen to this song all year round. I have never bothered about exfoliating before until this month because my skin has been insanely dry and my eczema has been playing up big time! I decided it was time to pick up some exfoliating gloves from Primark and I have been loving them ever since! I thought they'd be really harsh on my skin but they're really not, it's incredible! They leave my skin feeling silky smooth and I no longer have any dry flaky skin either! Sorry for the TMI. I believe skincare is so important throughout Winter and BeeGood Honey and Crambe hand cream and Raspberry and White Chocolate lip balm has been really working for my skin and lips this Winter Not only does it smell incredible but it also makes my skin feel so silky and smooth. "Subtle, fruity raspberry notes are balanced perfectly by the sweetness of white chocolate which adds a little touch of indulgence - truly addictive!" If you're looking for the most delicious tasting lip balm and a hand cream which isn't oily at all; then you need to check these out! The Burning Embers Palette for only £8 has been my go to Palette and it is absolutely stunning. I completely fell in love with this palette as soon as I saw it on the MUA website' it's absolutely gorgeous! I have been loving wearing warm toned eyeshadow's at the moment and this palette provides you with every shimmer, matte and different warm toned eyeshadow you will ever need, all in one palette! I have also fallen in love with the Eye Define Eyeliner for £2. I haven't worn liquid eyeliner in so long and after seeing some beautiful makeup looks this Winter I had to go out and buy a new one as I'm pretty sure the one I had is probably as dry as anything. I decided to try out one from MUA and I'm so glad I did. I love how precise this eyeliner is and how jet black it is. This makes applying eye liner so easy! I was recently sent the Nyx Liquid Suede Cream Lipstick in Cherry Skies - Deep Wine Red for review purposes and I am in love with this! Not only is the consistency of this product beautiful and not too drying, but the colour is gorgeous and perfect for the Winter Period! This is the first NYX product I have ever tried and to be honest, I'm tempted to go and buy some more of their Liquid Suede's, they're gorgeous! Especially Sandstorm! I absolutely love the Nurbesten 8 Piece Gold Makeup Brush Set, they're soft and excellent for blending various products! If you're interested in buying Real Techniques brushes but they're not in your budget, definitely check these out as they're a brilliant replica! I think these are absolutely gorgeous and for only around £16, you cannot go wrong with them! Plus, how beautiful do they look for photography? I have completely fallen in love with the KoKo Couture Darla Faux Snakeskin Handbag. "The Darla handbag is made from faux snakeskin and has a fun and fashionable design. It has foldover front and a large zip close pocket on the back that is designed to be used as a purse if the owner wishes, with compartments to hold essentials such as cards and a mobile phone. The bag also contains compartments on the main inside making it the perfect accessory for an organised girl! The bag has a small easy to hold handle and a detachable shoulder strap". A bag is a girl's best friend, and shoes of course! And the KoKo Couture Darla bag is perfect for anyone who is like myself that if they have a massive bag, they will fill it to the top till the point it's far too heavy to carry around! I fell in love with this bag when I saw the purse on the back, genius! My purse is probably the heaviest item in my bag and this means I no longer have to carry it around with me. I have been loving this bag ever since receiving it from KoKo Couture; it's so light and it's absolutely gorgeous too! This blog post features product/s which were sent to me for review purpose's however all opinions are my own and completely honest.